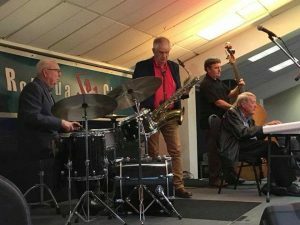 Membership of the Hamilton Jazz Society allows you to access lower price tickets to all HJS jazz gigs throughout the year and more! Subscribe here for Hamilton Jazz Society Monthly Newsletter. You can unsubscribe at any time. Returning to us again, the Hamilton Jazz Society are proud to present The Joe Carbery Swingtet in concert, on Sunday 28thApril, 4.30-7.30pm, at the Waikato Commerce Club, 197 Collingwood Street, Hamilton. Founded on a solid rhythm section of pianist John Wilcox, bassist Stuart Lawrence and the vastly experienced Jimmy Gibb on drums, with Joe Carbery on baritone saxophone and vocals. Our supporting artist this month is popular keyboardist Paul McIsaac.